Discount Magic - Magic Seen Iss 76 (September 2017). One of the things that I love about our magazine is the diversity of content that we try to ensure goes into each issue, and this edition is typical of that variety. There are some really interesting background interviews with well known performers, which effectively take you 'behind the scenes' in the personal and professional lives of cover star Jamie Raven, creative dealer Paul Roberts and quirky performer Kieron Johnson. So if celebrity is your thing, we've got that covered. Then again, we also like to provide helpful information on topics that could prove invaluable to you. 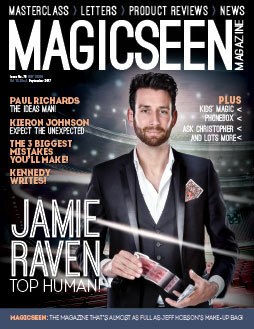 This issue we've got two great articles on the business side of magic performance. One is a compilation of advice on how to avoid common 'business' mistakes from some of the top names in the magic world compiled by Aaron Fisher, and the other is an insightful piece from Ken Dyne on how to increase the likelihood of getting corporate bookings. Arguably one of the most popular sections in every edition of Magicseen is the Reviews Section, and this time not only do we have the usual round up of comment on the latest releases, but we also provide an article that gives you an insight into how we actually go about putting the reviews themselves together. You'd be surprised perhaps at just how much thought goes into it!